Eight years in the tumultuous making and the first album since 1990 to feature returning singer Joey Belladonna, “Worship Music” comes at a time when New York’s mosh squad needs an ace. Opening with an eerie instrumental, the album suddenly explodes with “Earth on Hell.” Driven by a Gatling-gun barrage of drums, the song grinds and crushes like heavy artillery. Charlie Benante sprints like Flash, Belladonna wails like a warrior and the axe men come swinging like A-Rod. Anthrax is back! The aftershock that follows is “The Devil You Know.” Aggressively swift, contagiously melodic and heaving with added grunt thanks to shouted gang vocals, the track is everything Anthrax does best. A career highlight. ‘Nuff said. With bases loaded after three at-bats, Anthrax hits a MONSTER grand slam with “I’m Alive.” Building on a Goliath march of rib-punching Frank Bello bass and precision, double-picked crunch, “I’m Alive” is a dynamo of heavy pendulum swing. Is it signature Anthrax speed-thrash? NOT! Will it stick in your head like an ice pick? YES, please! Add a shred-gasmic guitar solo from Rob Caggiano and “I’m Alive” is the album’s crown jewel. Astounding at every turn! The thrill ride detours into left field a bit on the Dio/Dimebag tribute, “In the End.” With its epic expanse and sweeping vocal choruses, it sounds more like Dream Theater or Savatage than Anthrax (do I hear keyboards?!). Admittedly, the track warms up after repeated listens, but Anthrax fans rabid for thrash may call foul. Give it time. “The Giant” gets Anthrax back on the bullet train with a taut and muffled string-bending riff that will sicken Slipknot with envy. Belladonna’s call-and-response (to himself) vocals create a schizophrenic effect that quickens the song’s frenzied snap. A second tribute tune, “Judas Priest,” falls short of, um, delivering the goods. Mid-tempo, meandering and plagued by a sing-songy chorus, the six-minute good intention never finds its course. Likewise, “Crawl,” takes its title too literally and plods like heavy grunge. It’s hard to imagine either song inciting a Big 4 mosh pit. The two closing tracks connect with much better results. “The Constant” opens with a spiraling Dimebag-style riff while the closing track, “Revolution Screams,” packs a tidal wave of Pantera surge. Knowingly or not, the masters seem to have borrowed from their pupils. You could do a lot worse! In the end (sorry, guys), we’re left with a “comeback” album that delivers three, if not four, instant Anthrax classics; one amazing metal masterpiece, two impressive parting shots; and only three head scratchers — one of which ultimately grows on you (in the end). As poker-playing guitarist Scott Ian might say, “Worship Music” delivers in spades. “Worship Music” drops Tuesday, Sept. 13, 2011. Anthrax tours Texas in October. 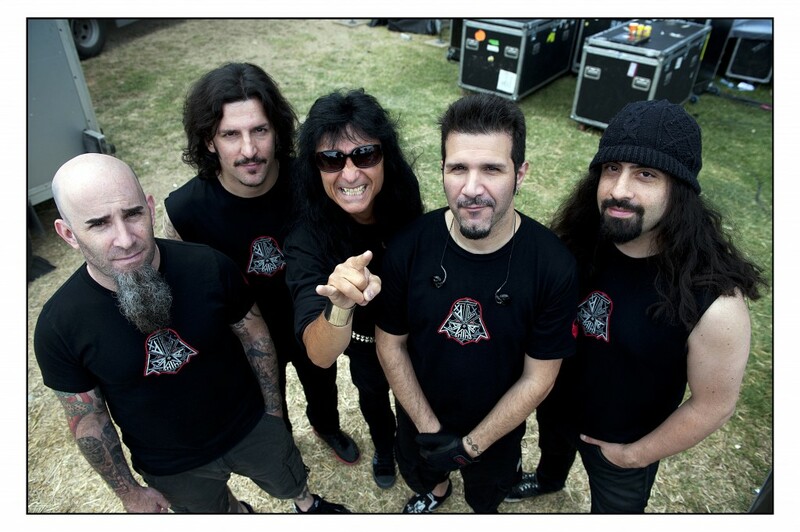 For more Anthrax info, go here. 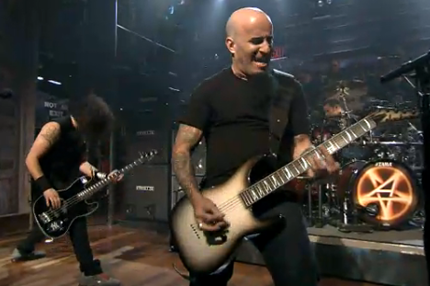 Watch Anthrax debut “The Devil You Know” on Jimmy Fallon below. You mentioning Pantera more than once puts me off a bit. I’ll be buying it this week for sure, but as always, I have hesitations. As always,a quality Metal Dave review. I listened to the record today in it’s entirety. Your review is dead on.